If I had a nickel for every flashmob video that has been forwarded to me…and that I haven’t posted. The brutal truth is that I still haven’t really figured out why these boring flashmob videos are getting so many zillions of views on Youtube. Why does anyone find these interesting at all? But I did adore this one…I got teary eyed watching these strong, defiant Beit Shemesh women, and seeing the blank/confused reactions of the Beit Shemesh locals made me laugh pretty hard. Thanks so much to Teresa Vanova for sending this my way! This isn’t a flashmob dance if it thanks a choreographer. It is obviously well practiced. 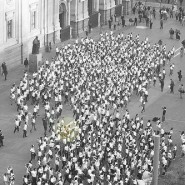 Flashmobs are always choreographed.. what makes it a flashmob is that it starts out of nowhere and everyone disperses into a crowd. I think the reactions are real. ALthough, I dont agree with a flashmob being used as a form of change because I think it is higly immodest. Why is this a good way to be defiant ? Aside from the halachic issue (and it is against halacha,it’s not a chumra) why can’t there be other ways to be defiant to discrimination against women?How about a conference or handing out pamphlets? A woman doesn’t have to be “out there” like that to be defiant. Things like this won’t change a thing. It’s one thing to stage a protest but they know that this is against Jewish law and they want to be defiant towards it. This won’t fight what they want to fight.. it adds to the fire. I think a lot of modern Orthodox women are just not really aware that it is a serious halachic issue, and they do not believe that it is actually a problem. Chaval, but I don’t think it is blatant defiance of halacha or Hashem. Ugh. More public displays of women dancing and shaking their groove thang. Why can’t a point be made without wiggling and jiggling in a flash mob? Hashem Yirachem. I agree with some of the other posters that this flashmob dance is not a religious thing to do as it is immodest. I am surprised that all these women who are covered up and looking Orthodox are dancing in public like this and attracting attention on the street and now all over You Tube and Facebook. I’m embarrassed by them and their decision. I am not sure why this video is so popular amongst so many Orthodox women. Although, I must admit it looks cool! Wish it really were for women only and not in this context. It’s very cool bit a total publicity stunt.did you see how many camera angles there are? I lined in bertie shemesh and none of the modestly dressed women three would be seen dancing in front of men.come on! These women probably don’t live in bet shemesh and are probably being paid to dress frum n dance.I hope truly G d fearing women would se this is a coarse way to grab attention; the complete opposite of tsniut by anyones standards. I simply can’t help myself, I got a really funny thought in my head: I’m visualising a flash mob of the “taliban” women!!!! and don’t get me started on the double-entendre of “flash”, either…. I DO admit I have a real soft spot for all those SECULAR flash mobs: must be all those “FAME” episodes I used to watch as a dreamy teen. On a serious note tho, I agree with Gila and the others. It’s a shame Orthodox women had to get on a clearly unorthodox bandwagon. When are we going to be proud of our modesty and stop trying to apologise for it one way or another by trying to be “just like everyone else”…. I agree with many of the women who posted here. As I was watching this I was thinking to myself, “What are they doing?!? !” This is not an appropriate thing for any bas yisroel and saddens me that it was done in an Israeli city with Jewish men and young boys watching. Terrible and not at all a Torah way to respond to such a crisis. I consider this to be a great non-violent way of expressing one´s oppinion. Far better than shouting at each other or fighting in front of children as we see from other related videos. This was also the reason why I sent it to Chana in the first place. I do see the point of all the comments mentioning halakhic issues of women dancing in public. But as a modern university educated orthodox person I just cannot see this as a violation of halakha – is this really immodest dance? Was it immodest when women sang and danced in front of men when they crossed the Red sea? The dancing by the Red Sea was not immodest because both the men and women were on a very lofty spiritual level at the time – as is said “a servant girl saw at the Sea what Yechezkel (the prophet Ezekiel) didn’t see in his visions.” The men had no possibility of inappropriate thoughts at the moment, and neither did the women. It was purely a dance for G-d.
As wonderful and holy as these women of Beit Shemesh are, I don’t think the same can be said of them – or anyone else nowadays.